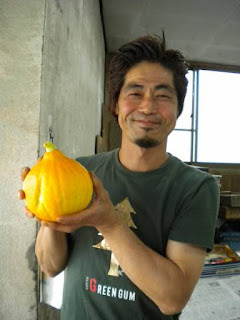 A Kamakura farmer with most delicious salad squash! Summer's heat is settling in and that means tomatoes, cucumbers, summer squash (zucchini and friends! ), green beans, and eggplant galore. Throw in a bit of miyoga (a soft-flavored Japanese ginger) and you've got all the makings for a cold soup to satisfy any appetite on a hot day. Seriously, what are you waiting for?